If you have enabled grading in discussions, you can get to the grading views quickly from Discussion Home. 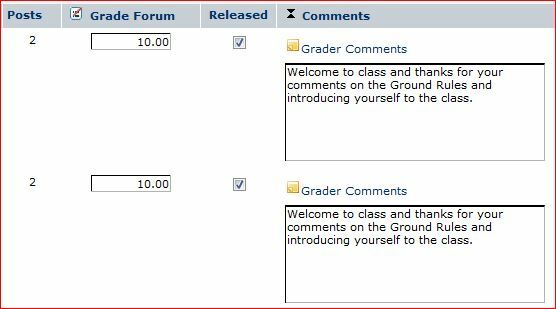 You may have grade-by-forum, grade-by-category, or grade-by-topic options enabled, as well as have forums that will not be graded, all in one discussion board. You can mix and match gradable components and have areas (forums and categories) that are not for grading, but rather are places for questions and other sharing. You can access the grading views when clicking on Recent Topics, as well. Working with Recent Topics is a great way to keep up with evaluating new student contributions as they come in. “Mark All As Read” or “Mark Topic As Unread” can be used strategically to keep track of new posts, and to flag topics that you want to leave as ‘unread’ to revisit later. To see which discussions may have ungraded contributions, look at the icons by the gradable items. The ideal place to evaluate posts is in the topic where they were contributed. To do so, click on the ‘grade’ button on a student’s post. A grading window will open where you can add private comments and a score. Click on Update to send the data to the Etudes servers. You may also choose to release this information to the student by checking the available box. You may go over the maximum point value of a forum or topic and award extra points to students, if appropriate. 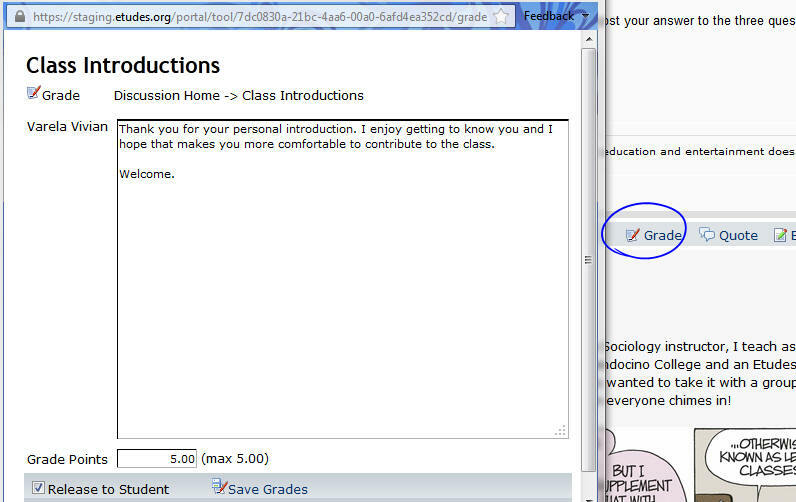 Click on Save Grades to preserve the comments and close the window. Continue with the next student’s post, following the same process. You can release your evaluation comments and scores to students as you grade by checking the “Release to Student” check-box, as shown above, or you may bulk-release your evaluation comments to students later. In the Grading View pages of discussions, you can view all contributions of students and see their total number of posts for a topic, forum, or category, depending on what grading option they established. From the grading view, clicking on a student’s name, allows you to see all of his posts to the forum, topic, or category. When clicking on Alex Smart’s name (in our example), we will see all four (4) of his posts to the “Unit 2” forum. Clicking on “Next User” allows you to evaluate those who have contributed and see each individual’s work – all contributions of a student in one page. By default, the grading view lists students in alphabetical order. However, you can click on the words “Posts” or “Grade Forum” or “Released” at the header row to sort the page by your desired header. 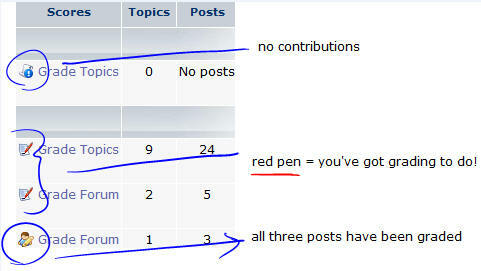 For example, by clicking on “Posts” twice, the list will show all contributors at the top of the list. Likewise, by clicking on Grade Forum, you can sort the list by fields that have scores and those who don’t have any. This way, you can see who you have not yet graded. To expand all the comments fields on this page, click on the expand icon. See below. From this view, you can choose to send the scores to the gradebook (GB). An entry will be created in the GB based on the title of the forum or topic. Note: Unchecking the “Send to Gradebook” checkbox and clicking on “Update” or “Save Grades” (same function) will REMOVE the item and scores from the gradebook. You can re-check and resend to the gradebook at any time. 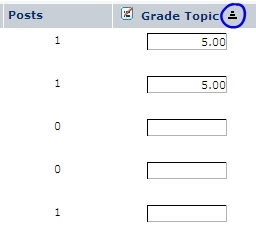 You can sort the grade topic (grade forum or grade category) column header to bring up graded or blank entries. This helps instructors sort by ungraded or graded participants. The ‘name’ and ‘posts’ columns are also sortable, assisting instructors further to find who has or has not contributed. If students have dropped the course, we don’t want instructors wasting time grading their posts. Therefore, inactive students are not listed in the grading view. Further, if students were dropped from a course, instructors and students can see their ‘inactive’ status by their name in their posts. Also, if site participants try to send a Private Message (PM) to a user who is no longer active or a member of the site, they will be informed. You cannot delete nor move a topic that has grades. 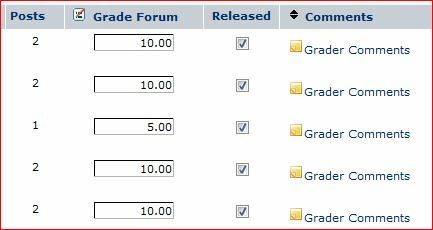 You cannot change a forum to non-gradable once it has grades. You can change the point value of a forum or topic, even if you have started grading. Just click on ‘send to gradebook’ to update it values in the discussions tool and the gradebook. You can rename titles of forums and topics. Upon clicking on ‘send to gradebook,’ the titles will be updated in the gradebook entries. The use of the gradebook with Discussion & Private Messaging is optional. The grading functionality of th Discussions does not require the gradebook in order to work. You may enable the gradebook from the onset, you may leave it out of your course sites. Or, you may enable it later in the term and send the scores over to the gradebook, at the end. Students will see your comments and / or scores in Discussions & PM if you have released scores to individual students or to the whole class (contributors). If you have chosen to send topics, forum, and category scores to the GB, students will also see their scores there.